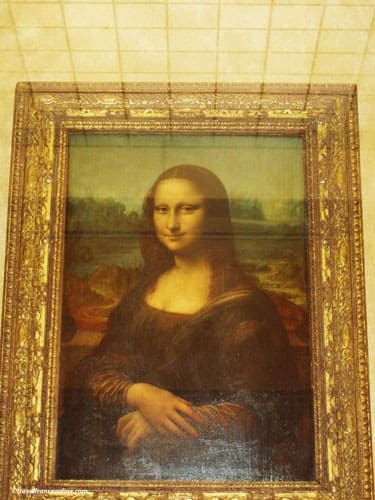 The Louvre Museum has the largest art collection in the world and a record attendance of over 8.6 million visitors a year - 30,000 a day! The splendid collection of books King Charles V gathered was unfortunately dispersed over the centuries. 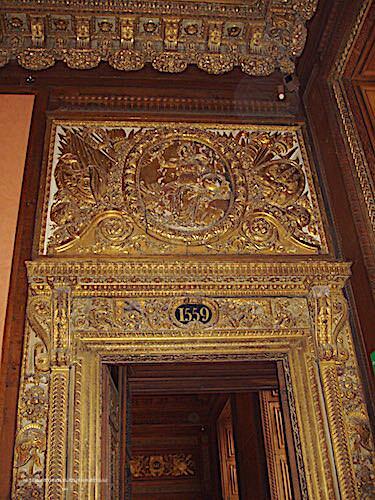 François I commissioned the great painters of the Renaissance to contribute a new collection. Paintings and sculptures exhibitions were indeed already open to the public in the 17th century. Fortunately, the Louvre Palace was not pulled down, but converted into a museum at the French Revolution. As a result Napoleon I and Napoleon III were able to enlarge these collections. Pei's Pyramid, in the Cour Napoleon, is the museum main entrance. The late Francois Mitterrand commissioned the architect I.M.Pei with its construction which was completed in 1989. Three smaller pyramids surround the 21m high glass pyramid and 700 diamond-shaped glass panes fixed on a stainless-steel frame reflect the light. 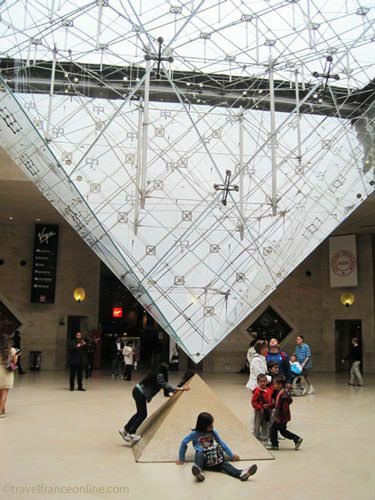 The central pyramid extends indoors with a Pyramide Inversée. The tip of the Inverted Pyramid is suspended 1.4m above ground and points down to a 1m high marble pyramid. The Louvre Pyramid is one of the many Parisian monuments illuminated at night. The entrance lobby provides direct access to the vestiges of the medieval Louvre Fortress - Vieux Louvre. The embankment of the drawbridge and foundations of the Vieux Louvre are still visible. So are those of the massive 31m high Grosse Tour that housed Charles V's royal library. A model of the medieval fortress helps you understand the layout of the medieval fortress François I demolished in 1546. 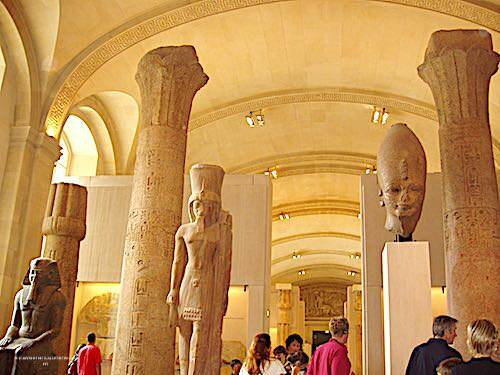 The Vieux Louvre accesses the museum's exhibition galleries. 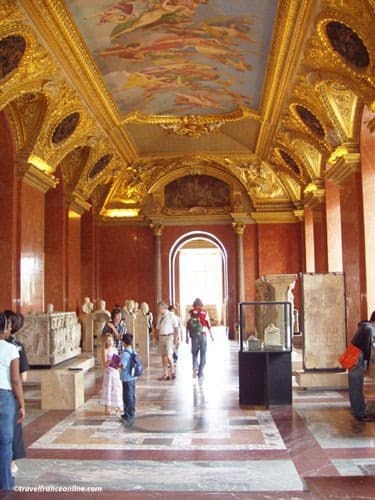 The Louvre museum was reorganized after 1981. 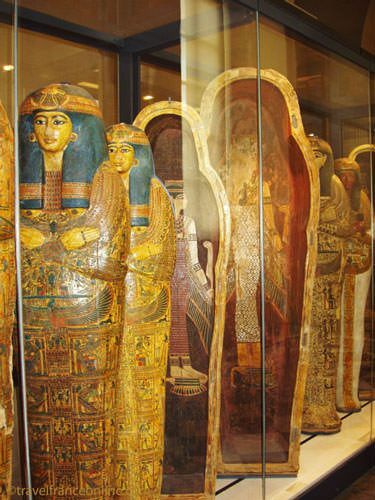 It offers the largest art collections in the world. Paintings (Raft of Medusa, Wedding at Cana, Mona Lisa...). Egyptian Antiquities (Seated Scribe, an exceptional work of art dating back 4500 years and notable for the realism of its details, sarcophagi, mummies...). Oriental Antiquities (Archers Frieze, Assyrian bas-reliefs ...). More than 400 000 exhibits are displayed in the 370 halls which are dispatched along three main galleries. The Sully Wing was open in the Square Court. The Denon Gallery occupies the Waterside Gallery. The Richelieu Wing, along Rue de Rivoli, was home to the Ministry of Finance until 1981. An eighth department devoted to Islamic Art collections was planned in 2003 at the initiative of president Jacques Chirac. It was inaugurated on September 22, 2012. This new wing's unique collections, the largest in the Western world, consist of about 18,000 objects; Syrian and Egyptian jewellery, ivories, miniatures and Ottoman ceramics from the 16th and 17th centuries. Exceptional carpets and unique textiles such as the Shroud of St. Josse are on display. Nearly 4000 pieces, granted by the Museum of Decorative Arts and the Museum of Fashion and Textile, enrich the Louvre Museum's new collection of Islamic Art. It perfectly illustrates the Islamic civilization from Spain to India, from the 7th to the 19th century. 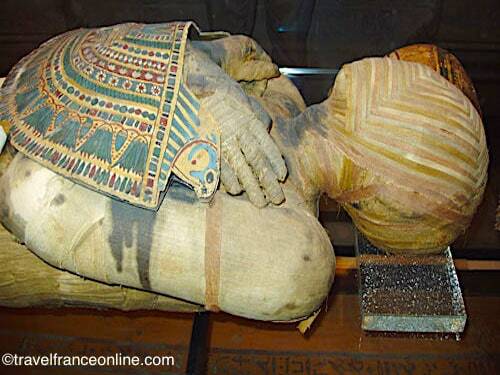 A display of 1200 years of history distributed on three continents! The main difficulty in creating this new department was the lack of space, as the exhibition halls were already saturated. 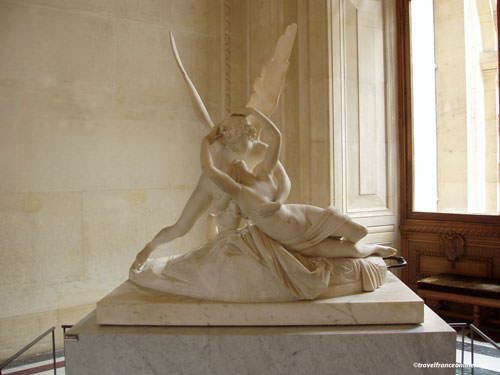 The only way to create new space was the Cour Visconti, one of the last available areas in the Louvre! The construction of the new department was entrusted to the architects Rudy Ricciotti and Mario Bellini. Work began in 2009 and thousands of cubic meters of earth were excavated to lower the level of the courtyard. 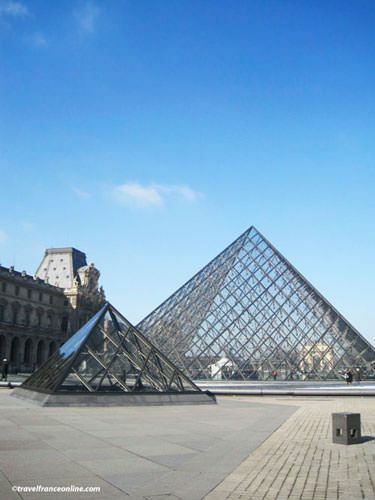 The Louvre Museum's original foundations located 2.5 m deep were strengthened. Pumps were put in place to dry the base of the excavation located 8m deep at the level of the water table, and allow the pouring of a waterproof concrete screed. The cavity thus obtained allowed the creation of two underground floors partly lit by means of mezzanines, and a ground floor at ground level. A glass and metal frame was rooted in the historic facades overlooking the Cour Visconti to preserve their visibility. This superb undulating canopy, which appears to float in the air, was nicknamed the Flying Carpet. The cost of the construction work totaled € 100 million. The French State funded at 30%. Total and Lafarge contribute 10-million. Prince al-Waleed bin Talal bin Abdulaziz al-Saud, a nephew of King Fahd of Saudi Arabia, contributed €17-million on behalf of his foundation. Finally, King Mohammed VI of Morocco, Sheikh Sabah al-Ahmad on behalf of the State of Kuwait, Sultan Qaboos bin Said and the Omani people and the Republic of Azerbaijan contributed the remaining funds.